Last year, every one in the world was shocked that how can a country so big, be flooded from North to South. It is not rare to see Pakistan flooded during the monsoon but those floods are isolated and not much dangerous than those of last year. During monsoon many cities of Pakistan experience urban flooding like Karachi, Lahore and Islamabad. There are many types of flood that occur in the country almost every year. 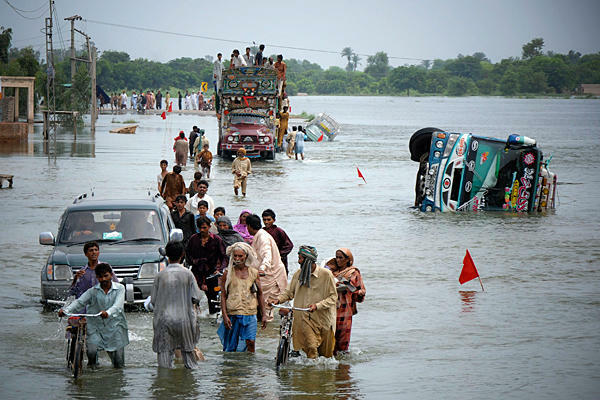 Monsoon floods are common in Pakistan. Monsoon rain can fill river basins with much water coupled with melting snows. Torrential rains from decaying monsoon low pressure area can also produce river flooding. 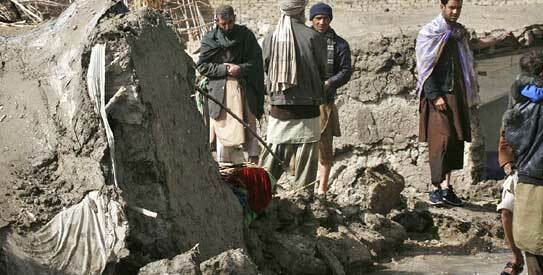 Flash floods also occur in Pakistan, they are common in the northern areas of the country and cause great loss of life there. Floods due to the breaches of river embankments and canal breeches are a frequent occurrence in all the districts of Pakistan. 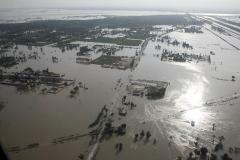 Urban floods occur in the major cities of Pakistan, they are also common in the monsoon season. Flooding in rivers is generally caused by heavy rainfall in the catchments during the Monsoon season, which is sometimes augmented by snow melt flows. Monsoon currents originating in the Bay of Bengal and resultant depressions often cause heavy downpour in the Himalayan foothills. These are additionally affected by weather systems from the Arabian Sea and from the Mediterranean Sea (through Western Disturbance) which occasionally produce destructive floods in one or more of the main rivers of the Indus system if they interact with the monsoon currents. However, exceptionally high floods have occasionally been caused by the formation of temporary natural dams by landslides or glacier movement and their subsequent collapse. These are large seasonal variations in almost all the river discharges, which further aggravates the river course and morphology. The major rivers cause losses by inundating areas along their banks, by damaging irrigation and communication facilities across or adjacent to their banks, and by erosion of land along the riverbanks. In the upper part of the Indus Basin System, flood water spilling over the riverbanks generally returns to the river. However, in the lower Indus Basin, where the Indus primarily flows at a higher elevation than adjoining lands spills do not return to the river. This phenomenon extends the period of inundation, resulting in even greater damages. Although embankments built along almost the entire length of the river in Sindh and at many locations in the upper Indus Basin have provided some protection against floods, poor maintenance of the bunds causes breaches. Such breaches often cause great damage because of their unexpected nature and intensification of land use following the provision of flood protection. Floods are a potential threat to land, property, lives, and the ecosystem. Floods cause revenue loss and damage irrigation and drainage channels. In 2010, almost all of Pakistan was affected when massive flooding caused by record-breaking rains hit Khyber-Pakhtunkhwa and Punjab. The number of individuals affected by the flooding exceeds the combined total of individuals affected by the 2004 Indian Ocean tsunami, the 2005 Kashmir earthquake and the 2010 Haiti earthquake. At least 2,000 people died in this flood and almost 20 million people were affected by it. There is a lot talk whether floods will occur in Pakistan this year or not. But it is worth mentioning that some isolated floods have been reported in different parts of the country. The latest was Dera Ghazi Khan where floods on June 12 started through Koh-e-Suleman and then entered DG Khan and in the end entered into River Indus. People who migrated following flood threat, have started to come back home. It must be noted that floods do not occur in this month because the monsoon has not started yet. Only western disturbance passes through Pakistan that cause some rainfall with winds. The DG Khan floods were also due to a western disturbance. The cold waves continued till early May and after that intense heat wave returned which have started an early process of snow-melt. Now the only thing that needs them to speed this process is Monsoon rainfall. These rains will act as a catalyst. The government should take care of this problem as soon as possible. Instead of blaming the nature or making silly conspiracy theories, we should work together so that our country becomes stronger and stronger because monsoon rains will occur and nature will not stop unleashing her wrath. It is us that should be prepared. So do you think that floods will occur this year? ← Tropical coverage of ARB 01 – over! Punjab,Nwfp and kashmir are very wet and flood may occur but this year flood chances are very less and we should not worry. h0w can u say that ? well..there will be two to three heavy monsoon spells of rainfall in Karachi in July and August…but keep in mind that weather changes very quickly..latest example is depression ARB 01 which 10 days ago…was showing stormy conditions in karachi today..
wait for monsoon season now……. there are good chances of widespread raindfall in Karachi from June 20/21…. BBC is Map not showing precipitation over karachi and nearer. This year BBC is not ready to show rains over karachi.Many other forecasters are also not showing any rains till many days. WHY IS IT SO? Do not follow BBC…according to them ARB 01 was a low..in real it was a cyclone on SSHS scale and depression on IMD scale…. weather is like that…it keeps changing..so all weather forecasters will keep changing their forecast.. Yes, For Unfortunate sunny and hot karachi you have said right but Punjab,Nwfp and kashmir to quetta will have above normal rainfall like always and Injustice will continue with karachi. There is No chance of Meaningful rainfall over karachi this year unless some miracle happens. The most two reasons because of which i am saying one is that “Rains either die out before reaching karachi or change its path”. Secondly, Above 80% forecasters shows sunny forecast for karachi always or next day they change forecast forecast from rainy to sunny. hopefully karachi will get good rains next week in the starting days just fed up of this sun and scorching heat babar bhao do let us updated abt the low pressure formed in the bay of bengal this is the only last hope before the monsoon arrival but ystrday i read that there isnt good rainfall comng to karachi this monsoon but i also pray that this comes to be wrong and karachi must see eventfull rainy daysssss……………………………………………..!!!!! When r u going to post ur new article ? forget rains in karachi, Noob City……..!! Inshallah one day karachi will get rains like Mumbai and dhaka, Times does not remains same and time will change. I do not know that when that day will come but it will surely come. When we are angry then we say karachi noob city or unfortunate and then we regret for it. what do u mean “when we are angry” we are always angry with karachi. Yes, There is no name of rainfall over karachi during winter and summer and we are always angry. Even if we talk about pakistan then, whole pakistan gets downpour during winter and summer except karachi and sindh. Actually, here regret means was that ” I think that if we daily say that karachi is unfortunate or use bad words with karachi sindh then, we may get punishment from GOD. I will also try to not use word unfortunate again with karachi and sindh . We should pray for rains in karachi and someday its weather will change in to thunderstorms and cold. The most known cause that “Rains die out while reaching karachi or change its path”. pls think wat u wish for mate , u have no idea … try to take my point. Karachi Metro what is the reason behind today’s winds in Karachi? indicating some up coming Weather System? Will Pakistan Weather Portal be changing its web address or not? Seems like most people don’t want it to change. Final decision on July 1……..
Will there be good news for Karachi in ur new article ? it just came right n0w. gfs showing a weather system which is reaching 22june 2011 in sindh .is any chance of rain from this system.